and then toddling off. Eight hours later, you've walked through three airports, wondered if anyone knows how to read airline seat numbers correctly, and gotten to a hotel in a new-to-you city that you're too tired to leave, so instead of going out to see the city you order room service because comfort food and a slice of chocolate cake is second only to having your kitty fall asleep on you. That's what travel is like. As part of the Penrose quilting challenge I set up for some people earlier this year, I decided I should be fair and learn a new skill, myself. Don't push others unless you're willing to be challenged yourself, or some rot like that. 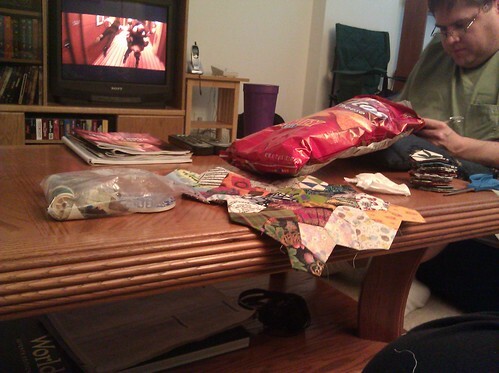 I took up English paper piecing because it looked intimidating and I'd never tried it. 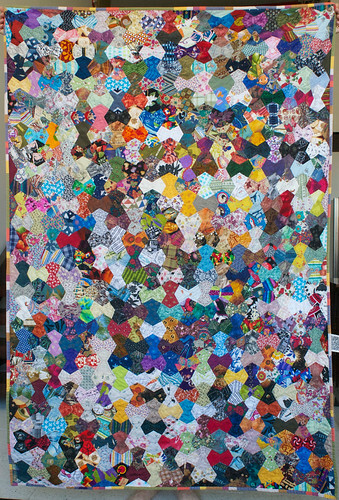 There's no rhyme or reason to this quilt; it's just a scrappy pile of everything-in-the-bin, with two of each. 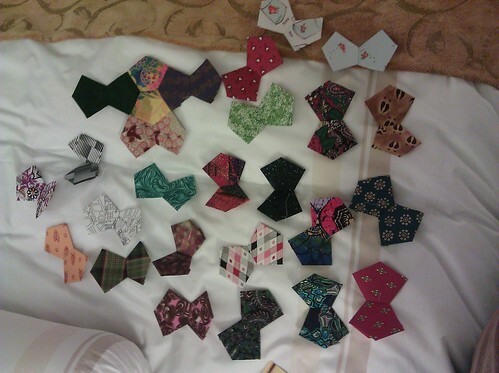 Ages ago, Jacob had sketched out a quilt design that he called Bow Tie Pasta, but I never got around to executing it. 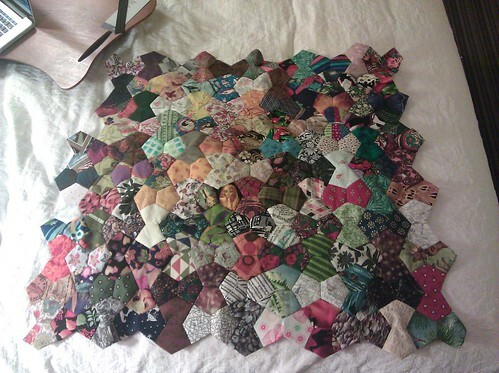 When I found Liesel's funky irregular pentagons, I realized they'd make a scrap quilt that would strongly resemble Bow Tie Pasta's original idea … but I just couldn't call it BTP. Nameless, I kept sewing. Airports, hotel rooms, and mass transit saw me whipping out needle and thread to baste fabric to paper. It hit me after a while that as long as I did even a little in Phoenix, I would technically hit all four major time zones with this little quilt top. 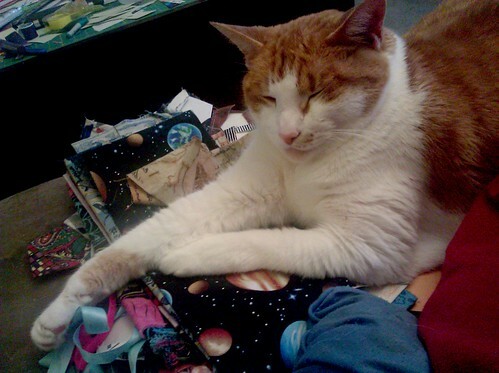 Once I learned that I'd need to make an extended trip to Boston, I started frantically cutting fabric and stuffing a zip-top bag full of it to prepare for the trip. Three weeks is a long time to spend in a hotel room, and my suspicion is that this quilt will be a sanity-saver. Obviously, you've already seen the name of the quilt, but seriously? 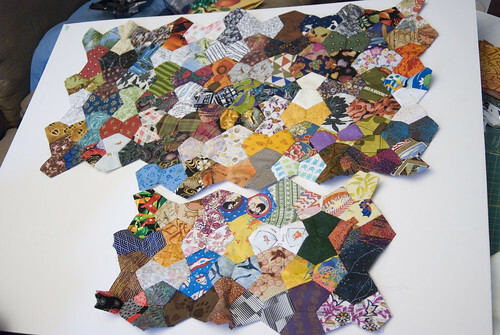 I worked on English paper-piecing quilt, in Washington D.C., and it's made out of pentagons? What else could I call it other than Pentagon Papers? Ok, fine. I'm a nerd. I get it. But my poli sci friends just laughed when they read it, I bet. at Mishawum, Woburn, Massachusetts, United States by domesticat. I can't help smiling at this quilt. Mainly because I know so many of those fabrics. Some of them I introduced to Amy myself. Others were purchased on my advice for various quilts. Some are from her stash. An annotated version of this would have to be a coffee table book. We seldom know what goes into these quilts, but sometimes there's a lot of thought and emotion bound up in those threads and colors. A stranger may look at say, "What a lovely pattern that fabric there is." Someone aware of it might say, "That's from that one time in your life, isn't it?" I've noted in a comment elsewhere on this blog that Amy's approach to quilting is very comprehensive. She'll work with what she's given, but if she's planning something from scratch, every fabric included will be chosen, the piecing pattern matters, the quilting pattern matters, the size is suggestive. She doesn't build generic quilts for the mass market. She custom-makes each one, like some legendary architect. She's not setting up the sub-division for Peachwood Homes, she's doing the next Fallingwater. I don't know if she thinks of it, but her collection of quilts is probably enough right now to be a museum exhibition. Imagine what she'll have accomplished in the next few decades. Each one is named, has a home, and a story. It is a slice of many lives, tied together in fabric. I'm the kind of guy who wears a bow tie with a suit. I'm wondering if I can sucker some of my Shiny New Co-workers to help hold up the quilt so we can do weekly progress photos while I'm here. It wouldn't surprise me in the least. Ask if any of them have photo-gray shirts so you can color-balance while you're at it.